Why You Should Drive an Electric Car – Planet Geek! This morning, while getting ready to go to the Worcester Electric Vehicle Ride and Drive Event I put together a little placard to show next to my Chevy Volt to answer some basic questions. 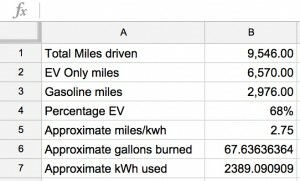 What is a Volt, how efficient is it, etc. It got me thinking. How much is this really helping things? Am I really driving green? Well, lets take a look at the numbers, purely from a CO2 emissions standpoint. I’ll use my current statistics since I bought the car May 1st. The spreadsheet is to the right. 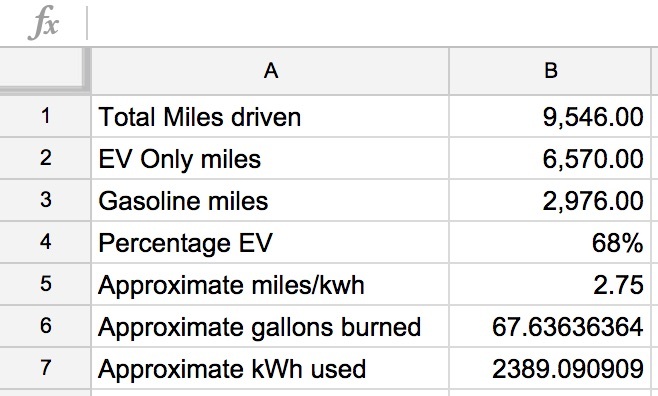 If I were to drive all 9,546 miles on a gasoline engine at 40mpg, I would have burned 238 gallons of gas. Each gallon of gas burned releases 18 pounds of CO2. I would have released 4,295 pounds, or a little over 2 tons of CO2. I only drove 2970 miles on gas, so I released only 900lbs of CO2. Stark numbers, wouldn’t you say? Now, there’s other factors. Even though I didn’t burn the gasoline myself, that energy had to come from somewhere. I purchase my electricity through National Grid and have signed up for their Green Energy program that makes sure my money goes to pay for green power, so one could argue there’s no emissions for my usage. But lets assume I get my power via normal channels. According to the EIA, Natural Gas releases 1.21lbs of CO2 per kwh generated. I’ve used 2,389 kwh, totalling 2890lbs of CO2 if I sourced it from natural gas, bringing my total CO2 emissions to about 3790lbs. By that measure, I’ve only saved a few hundred pounds of CO2. We’re putting aside the other nasty stuff that’s generated by internal combustion engines. But you cannot improve the cleanliness of an internal combustion engine just by checking a box on your power bill. You can do that with electric. With one checkbox (“Use green energy sources”), I cut 4tons of CO2 out of my carbon footprint every year. Range. I drive twice a week distances far greater than any electric road vehicle can manage 700 km to be exact. And no, pit stop for night worth of charging isn’t an option.